Photometric observations of this microlensing event are presented and interpreted. 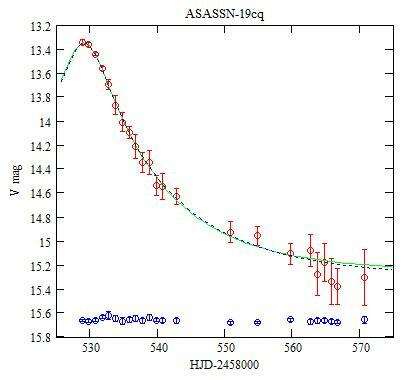 The discovery of the candidate microlensing event ASASSN-19cq was reported by Sokolovsky et al (2019), on Feb 12. I observed this event from Feb 13 until Mar 27, 2019. The observations were carried out with a 203mm f/6.3 Schmidt-Cassegrain telescope, a V filter and a ST7E camera (KAF-401E CCD). The duration of each exposure is 200 s. A total of 471 valid images were obtained over 23 sessions. 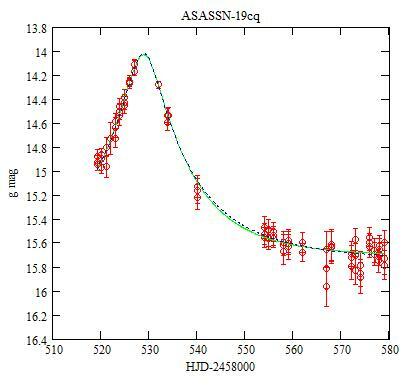 For the differential aperture photometry, the comparison star is UCAC4 383-92972 (RA=17:46:48.98 DEC=-13:30:30.1) with an APASS magnitude V=12.227, and the check star is UCAC4 383-93080 (RA=17:46:58.07 DEC=-13:30:43.9). 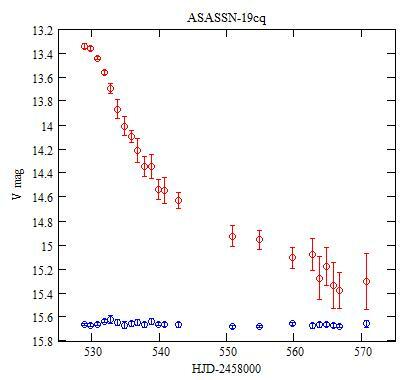 The individual measurements of ASASSN-19cq (red) and of the check star shifted by +3.1 mag (blue). Each dot is the average of one session, and the error bars are ±1 standard deviation. The theory of the gravitational microlensing is explained in Wikipedia. (umin, the impact parameter, is the minimum distance, at t=t0). 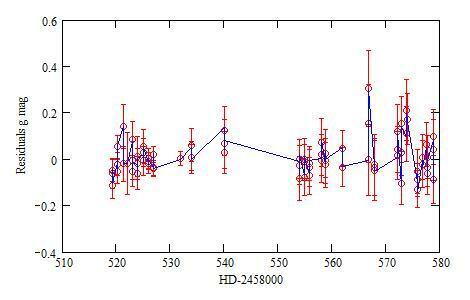 In the CMC14 catalog, the lensed star has the magnitudes r'=14.766, J=12.269, H=11.539 and K=11.325. Owing to the transformation formula of Bilir et al (2008) and Smith et al (2002) it can be computed that it has the magnitudes V0=15.389 and g0=16.217 in the V and g bands respectively (when not lensed). The V(t) function is fitted to the observations using a Monte Carlo method. There are 4 parameters to be adjusted: umin, t0, tE and also V0. V0 needs to be adjusted because it is determined by transformations formulas, which are only approximate, and also to allow for a possible shift with the different photometry setups. V0 around 15.389 ± 0.3 mag. 106 sets of 4 parameters are taken randomly and, for each set, the quadratic sum of the residuals of V(t) from the observations, weighted with the uncertainties on the magnitudes, is computed. The set that gives the smallest residual is selected. The process is repeated 10 times. The averages and the standard deviations of the selected sets of parameters are retained as the best fit to the observations. Actually, this is repeated a number of times to be sure that the results are stable and that there is no degeneracy (i.e. different sets of parameters fitting the observations). Dot blue: the Vb(t) function. Red: residuals of the observations from the V(t) function, Blue: from the Vb(t) function. with the + for the lens being closer to the lensed object, and - for it closer to the observer. Continuous curves: dL+, curves with dots: dL-. 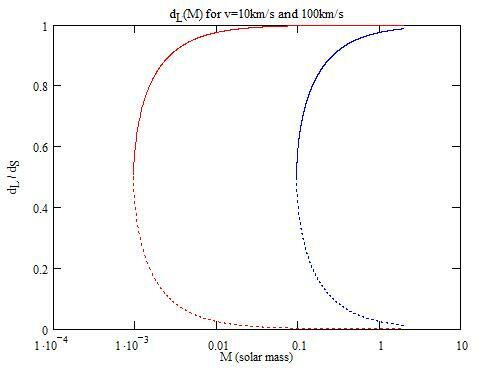 The 2 red curves on the left are for v=10km/s, the 2 blue curves on the right are for v=100km/s. owing to the Monte Carlo method, as above, except for the magnitude without the lens: g0 around 16.217 ± 0.6 (not 0.3 as above, which appears to be too small here). The fit with the blending gives a value of g0 very close to the one obtained from the CMC14 catalog. The parameters obtained with blending are the same as (within the uncertainties) those obtained from my observations, also with blending. 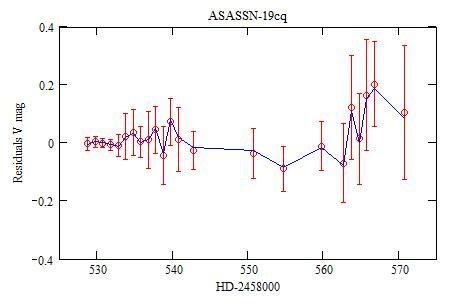 The blending factor is a bit stronger for ASAS-SN. 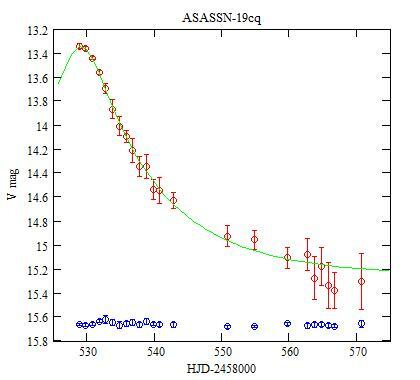 Red: ASAS measurements, Green: the g(t) function, Dot blue: the gb(t) function. Red: the residuals from the g(t) function, Blue: from the gb(t) function. 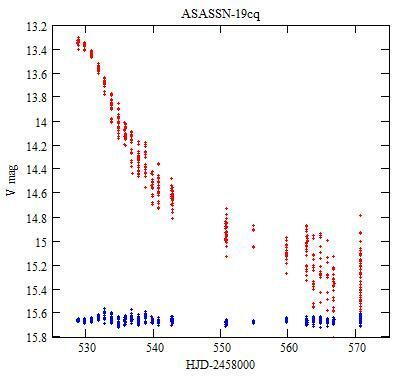 Both my observations and the ASAS-SN observations are fitted with the same gravitational microlens lightcurve. Furthermore, these observations are in different wavelength bands, which comforts the microlens interpretation. The lensing object may have a mass in the range of 1/100 solar mass (a brown dwarf), anywhere along the line of sight. There is no evidence for a binary. Bilir S. et al (2008) MNRAS 384 1178. Nucita A.A. et al (2018) MNRAS 476 2962. Smith J.A. et al (2002) AJ 123 2121. Sokolovsky K.V. et al (2019) ATEL #12495.